Silicone oven mitts seem like a strange and unearthly beast to me. Honestly, I was raised on good old cast iron cookware, hand-quilted or hand-crocheted hot pads, and other such rough-and-tumble kitchen goodies. In fact, 2015 marked the first year I ever owned anything silicone for baking, and these mitts came to me in December of 2015. Though I was initially very cautious, I’ve quickly fallen in love with all things silicone, including these Tortoise Tough silicone oven mitts. Despite being raised on good handmade hot pads, I’ve more recently been reduced to cheap dollar store oven mitts. These things were okay for a little while, but we’ve actually had them for years – and moving very quickly with all hot things, because they get hot enough to start burning skin within 3-5 seconds. Obviously, I had to do something different. While I’d like to say that I did extensive research and decided to buy these awesome Tortoise Tough oven mitts as the clear winner, that wasn’t the case here. In fact, I’d never even heard of silicone oven mitts (the burns weren’t enough pain to go looking yet) until they were offered to me for review. As you’ll see in the disclaimer below, this fact doesn’t influence my opinion of the mitts – it did, however, significantly influence which oven mitts ended up living in my kitchen. 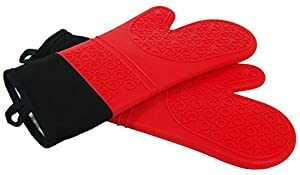 Honestly, there are a lot of oven mitts all over Amazon and other buying platforms that look exactly the same but with different brand names attached. For all I know, they’re all exactly the same. Out of the package, these mitts seem almost too thin to be useful. They’re lightweight and flexible with a breathable layer of quilted material inside. They’re so light, in fact, that I was initially afraid to use them on very hot items, such as my cast iron griddle right after I shut off the flame. These oven mitts have an extra-long cuff, which is really nice for people like me who are of average build and who don’t like getting “bitten” by bits of hot grease snapping out of frying pans. The entire length of the mitt and cuff together comes to only two inches below my elbow. I love this feature. For people like my husband, however – who is a chef, and the primary food preparer in the house – it does make them difficult to get on because of his above-average hand size and 9-inch wrists. You big guys (and gals) out there might want to just brave the flying grease and buy the mitts with shorter cuffs. Despite my initial misgivings, I did start picking up hot stuff. I started with removing my thin aluminum cookie sheets from a 350-degree oven, and slowly moved up the ranks of heat and density until I trust these mitts wholeheartedly. When I safely picked up that cast iron griddle to pour off excess grease and then return it to the flames, I was hooked on these silicone oven mitts for good. Not only did I not feel any heat on my hands and there was no damage on the silicone, but there was barely any detectable heat on the silicone surface after just one minute. The Tortoise Tough silicone oven mitt has texturing over all gripping surfaces to prevent slipping. Another awesome feature of these oven mitts is the raised texture over the entire grabbing surface – on both sides of each mitt, even, so you don’t have to worry about a “right mitt” and a “left mitt.” It prevents slip even on slick, greasy surfaces, and helps heat disperse into the air instead of directly into a solid mitt. Finally, I love how easy these things are to clean. While the mitts are machine washable, this is only really necessary when the quilted interior gets soiled. For the outside, just wipe the mitt clean with a damp cloth or sponge and you’re done. Any food comes right off, including most foods that have had a chance to dry. Overall, these are excellent mitts – especially if you have small or medium hands. I am truly surprised at just how much I like these, and anticipate using them for a long time to come. I’ve only had them for a couple of weeks so far, so I can’t yet comment on the overall lifespan and durability. I will update my review as I know more on this count. The only drawback in our household is that the mitts are slightly too small for my husband. Though he still wrestles them on, he’d benefit from an extra-large version of these mitts. On that note, though, there are a lot of things that don’t fit him properly because of his tall, stocky Northern European build, and that really can’t be helped with “one size fits most” products like this. Disclaimer: I received this item at a discount in exchange for my honest review. I am in no way affiliated with the company that manufactures these oven mitts, or with any third-part sellers. My compensation remains the same regardless of whether I have a positive or negative opinion, so my reviews always reflect my actual experience with the product.